This interactive presentation contains the latest oil & gas production data from all 13,020 horizontal wells in North Dakota that started production since 2005, through November 2017. Oil production in North Dakota increased by 1% in November, to almost 1.2 million barrels of oil per day, after the 7% rise in October. Gas production made a new high at 2.1 Bcf/d. Operators have been more careful in managing initial flow in 2017, which is why the actual production peak of new wells is not reached until the 3rd month on production (see the ‘Well quality’ tab). One question I received last week is how I deal with survivorship bias, that is, how wells that are no longer producing are taken into account. Once a well has started production, I will ensure that each calendar month it has a production record, whether producing or not (even when it is plugged). This way, the production of each cohort of wells can be analyzed in an easy way, and no bias exists. This is also why the well count doesn’t change over time (see the tooltips), if you select a certain group of wells that started in a specific month. The number of drilled, but uncompleted wells has remained rather constant in North Dakota through 2017 (808 in Nov, vs 816 in Jan). Of the leading operators Continental Resources grew production the most in 2017, as is visualized in the last overview (“Top operators”). This “Ultimate recovery” overview shows how all these horizontal wells are heading towards their ultimate oil or gas recovery, with wells grouped by the quarter in which production started. The 275 wells (dark blue curve on top) that started in the 3rd quarter had on average an excellent 3rd month on production, producing on average a cumulative 50 thousand barrels of oil. In comparison, this was about 50% higher than the wells that started 2 years earlier (in Q3 2015). Despite these higher gains early on, you can see that the wells in recent quarters follow similar decline paths as earlier wells. Quite a bit more natural gas is recovered though, which you’ll note if you switch ‘Product’ to gas. Unfortunately for the operators here, not much money is earned on this, due to low gas prices. 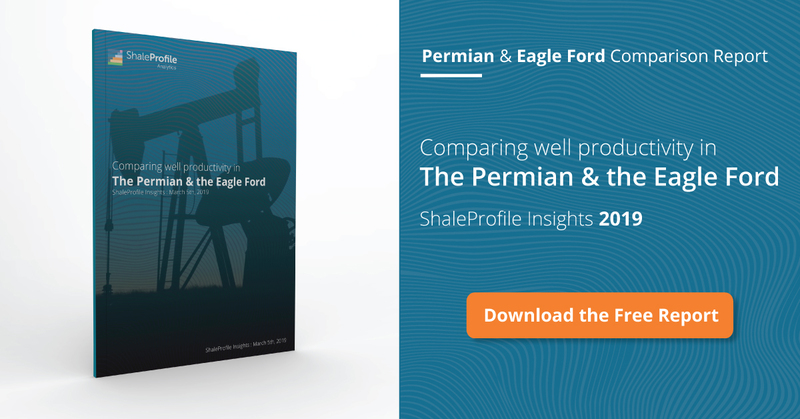 Next week I plan to have new updates on the Permian and Eagle Ford. I find the performance trends of wells completed in the first 4 months of 2017 interesting. The concave down nature in the early time behavior is going to be very interesting to track. I would suggest it is a result of aggressive flowback and submersible pump installations maximizing the early withdrawals until you run into the wall created by having something with permeability of concrete feeding the system. Should you wish to verify or disprove some of your hypotheses, the info available from ND’s DMR site via their primary subscription contains copious detail about every Bakken well. This would include timing and type of AL hardware installation. The Bakken operators have had an enormous increase in produced water the first 4 to 6 months online, 150,000/200,000 barrels on a few I’ve seen. Historically it would be under 10,000 bbls dropping off quickly to 2/3 thousand. Although details are sparse, a reasonable assumption might be that the elevated formation pressure brought about by the injection of hundred of thousands of barrels of water is assisting in driving a higher level of hydrocarbon flow to the wellbore. All the operators say is that choke management is a tool being aggressively implemented. Enno, I think you might need to check your North Dakota data. I cannot find any of these wells Hamm is talking about. At what point does the SEC knock on this guy’s door? Not too many of those so far indeed. Looking at the ‘Cumulative production ranking’, and removing the ‘Other’ formation (which contains some conventional horizontal wells), just 5 wells have breached the 1 million barrels of oil mark. But note that operators often include gas with the 6:1 conversion, and that the gas/oil ratio goes up over time, boosting UR numbers. Still, even then 1 million BOE is not a typical well. While Enno’s big data and vivid plots clearly point out that most Bakken wells are way short of 1 million BO in the end of their life cycles; it clearly also shows the improvements over the last 2 years, and the Initial Production rates almost got doubled, and if this proportionally extends to the final ultimate production, we are seeing many wells will realistically reach 500KBOE, or 400KBO in the end of their life cycles. This doubling of IP and ultimate production certainly give people the hope to see a new Bakken, much like Elon Mask’s promise of the ever better solar and electrical cars. 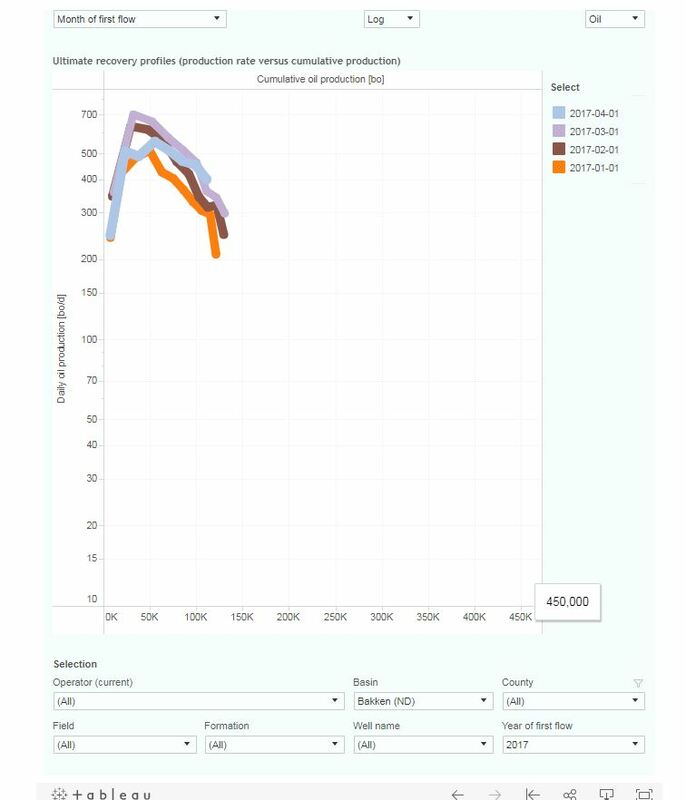 Also, as Enno’s website shows the differences between shale gas and oil with shale gas EUR per well reaching 6BCF (or 1MMBOE) is not a dream in Marcellus, most shale oil wells never get a chance close to that. While this might let people believe E&P shalers are cheating 3 or 4 times the EURs for shale oil wells, I would like to point out that the spacing of the shale oil wells are usually 1/2 or 1/3 of the shale gas wells (1,000′ typical) — this means the resources might be there just the cost is higher. With pad drilling and zipper fracking and completion, there might be a hope that cost will be lowered and efficiency improved. Newer Bakken wells have higher initial GOR, and GORs are rising much more rapidly. This could easily mean that the slope of production profile is different, as solution gas is the driving force of tight oil extraction. At least in Eagle Ford the gassy areas have inferior oil EUR. It could indicate drillers are moving away from the sweet spots, as many observers have predicted.